Assisted migration is a controversial ecological technique by which organisms are deliberately introduced into new habitats as a means to survive rapid environmental, change especially climate change. The Neringa peninsula is a narrow strip of dunes between the Baltic sea and the Curonian Lagoon. In November and December 2013 I was there for the Techno-ecologies residency at Nida Art Colony. The region has a particularly longstanding and dynamic history of ecological restoration. My proposal was to research this history and current thinking on landscape restoration as an aesthetic practice. 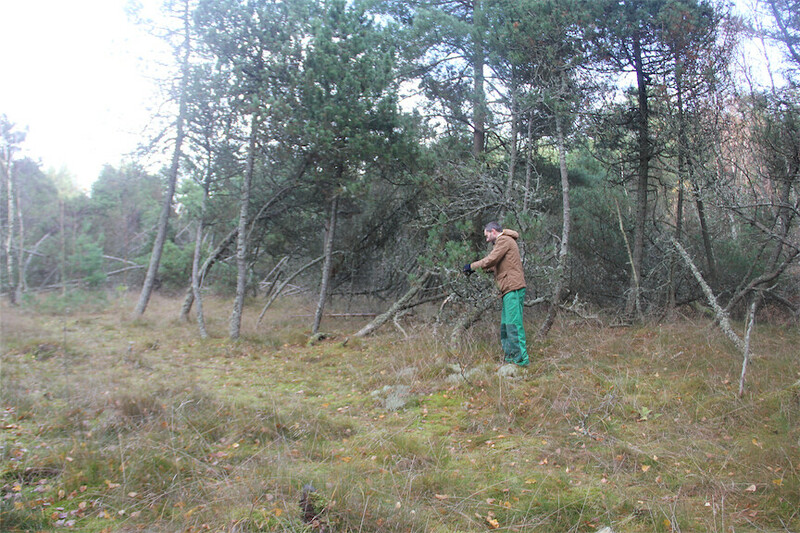 A lichen specimen found at the Spanish village of Pereiraboa during the Default#1 journey was a good starting point for discussing the opportunities and limits in current ecological practices, but perhaps also local wilderness aesthetics and revegetation policies in the Curonian Spit National Park. The Spanish sample contains lichens from the family of Evernia (antler lichen), which is ubiquitous on the Spit, and Usnea (beard lichen), which is certainly not common here. Luckily, after about two weeks of visual surveying, I found one place that also has native lichen from the Usnea family and it is quite close to Nida Art Colony; at the site of a stone-age settlement. With permission from the National Park I placed the Spanish lichens amongst their somewhat smaller Baltic cousins. The location is particularly fitting as it apparently also hosted some of the first human settlers during the previous era of rapid climate change. No traces of the settlement are currently visible except for a sign that presents some details about archaeological excavations on the site. Realistically it will be quite a challenge for this lichen specimen from Spain to survive the Lithuanian winter. The environment may not provide a climatic niche. This was part of the reason for park officials accepting the introduction of the lichens. However, the origin of the samples was rather high up in the Spanish mountains, so it will have some level of adaptation to the cold conditions. It is not my intention to endorse assisted migration as a practice. In this particular case the ecological risks involved are relatively small and I think it has ignited an interesting debate about authenticity, environmental restoration and domesticated wilderness. The progress of the lichen sample will be monitored.